Most people who shop for a computer generally chose a few of the above categories, then search for each of the chosen items, selecting those with the largest number at the lowest cost. Yet there is more to a computer than these basic components. The above categories determine the speed of the machine and its ability to process data. But these categories of technology are supported by a blend of further technologies that not only give a machine its character but it’s function. This group or blend of technologies are often referred to as the architecture. The architecture dictates not just the type of RAM you can install in a machine, but it’s speed. This also applies to the CPU as well. It also dictates what types of storage can be attached, what kinds of devices you can use to get data in to and out of the machine even the amount of power the computer uses. By far the single most important group of technologies that support the other features of your computer is the chipset. With each new CPU technology explored by AMD or Intel they develop a chipset in tandem. The chipset is best thought of as a group of complimentary processors that regulate and manage things like expansion slots, storage, disks, USB devices and they provide the CPU access to those devices. By using other chips in the computer for these basic tasks, it free’s up the rest of the computer to do what you need it to. Playing games.. 🙂 In a PC the chipset can be broken down into two principal processor categories; the Northbridge and the Southbridge. This is a chip that contains the technologies required to manage things like RAM and the card slots into which devices like Video cards are plugged into. Increasingly the functions of the Northbridge are being more tightly and completely integrated into the CPU. 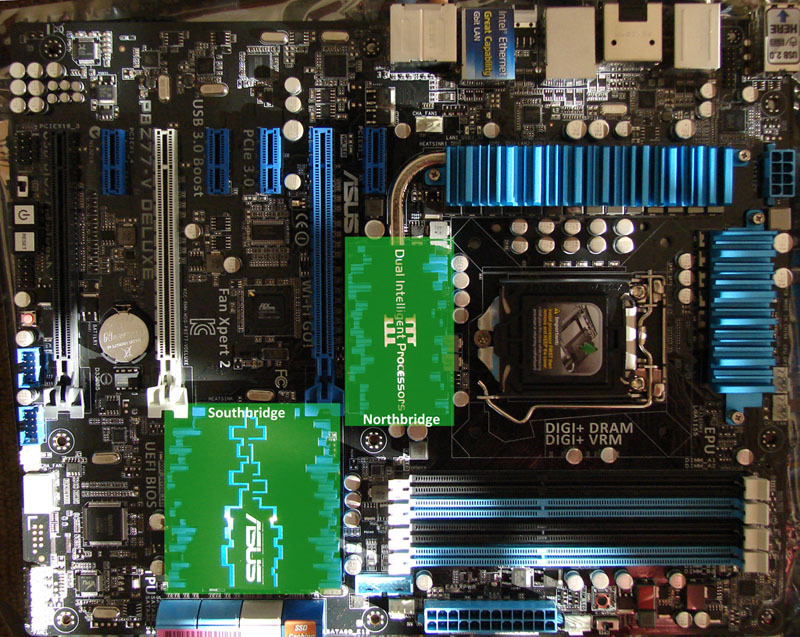 By integrating the components of the Northbridge into the CPU many functions are accelerated and the cost of the main or motherboard is reduced. It is the integration of these components that led in part to the development of Intel’s i series of processors and certainly, distinguishes those CPU’s from earlier models. This chip typically manages the slower components of the computer. It is sometimes known as the Input/Output Controller hub. It manages USB, audio, storage devices and the basic system startup code. As the Northbridge has become increasingly integrated into the CPU the Southbridge has been increasingly connected directly to the CPU. With the next generation of Intel Processors the Southbridge is expected to be increasingly integrated into the CPU, once again, accelerating most of the functions of a computer. These chips working together give your computer it’s basic functionality and dictate the technologies that your machine can use. Of course as the functions that are integrated into the CPU improve or change, so does the CPU’s shape, size and more critically the number of pins required by the CPU and its socket. As such each chipset can support functions on a very narrow band of CPU technology. This is why when a new chipset or CPU becomes available it often requires a new main or motherboard that incorporates the required architecture to support the new generation. Intel is expected to launch its next generation of CPU’s and chipsets in mid-2013. As such many retailers will be clearing out old stock and the next generation of PC technology introduces us to CPU’s that are 10-15% faster with new memory technologies that will accelerate all the computing functions.